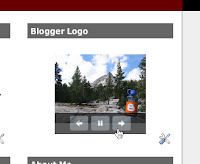 Take a look at our latest tool for your blog: the Slideshow page element. This feature lets you add a slick little slideshow of your photos from Picasa Web Albums, Flickr, Photobucket, or any site that supports Media RSS. 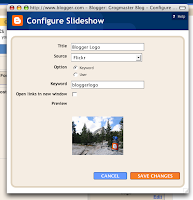 Like all page elements, Slideshow requires that your blog is using Layouts templates. Still need to switch? Read our help article on the topic. In case you missed it: Want to see everyone’s photos? Watch Blogger Play. on DonorsChoose.org. Over 100 blogs and their readers helped to raise $420,000 for classroom projects benefitting more than 75,000 students in low-income communities. For more details and a list of some of the top blogs involved, check out the Official Google Blog. The results are in from the Blogger Challenge on DonorsChoose.org. Over 100 blogs and their readers helped to raise $420,000 for classroom projects benefitting more than 75,000 students in low-income communities. For more details and a list of some of the top blogs involved, check out the Official Google Blog.